NEW RELEASE TUESDAY: LUCINDA WILLIAMS, PRINCE AND EXCLUSIVE BREAST CANCER AWARENESS PINK VINYL, PLUS VINYL TUESDAY AND EDMOND DANTES RELEASE PARTY!! It’s New Release Tuesday, and a very special one because we are hosting the Edmond Dantes Release Party at 6 p.m. to celebrate the release of their new EP Juno! 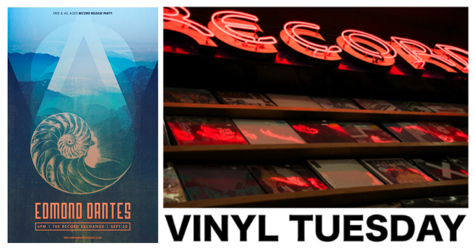 Our new Vinyl Tuesday sale also continues this week – customers receive up to $5 in used vinyl* with every $25 in new vinyl purchased all day long every Tuesday! Previous EDMOND DANTES RELEASE PARTY SEPT. 30; 'JUNO' COMES OUT THAT DAY, TOO!